Tinkering little things for kids, and especially for babies a lot of fun, the result of which always makes melt and causes only positive emotions. And when you see the fruit of their labor and the baby, why, I always want to do something else for these little tots. One such lovely and interesting veshchichek and are booties. At first glance it may seem, that they do is extremely difficult, but in fact it is, of course, not so. It is only necessary to have the most basic knitting needles or crochet skills, have patience, little training, be careful when working and, of course, during disassembly circuits. Begin to knit their first booties better with the simple mating, if you want to do it with needles, the example, garter or stocking, and if the hook, the columns without sc. Yarn for knitting is preferable to use natural or special children, so as not to cause irritation on the baby's skin or allergic reactions. 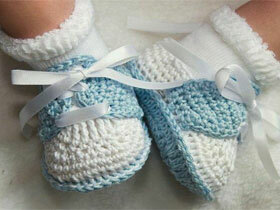 Booties should be done exclusively on the child's leg, so that they have the right shape. Future little shoe should not be tight to the legs and at the same time is not desirable, that it was not too loose, otherwise bootees will always subside. Preferably knit booties whole, seamlessly, or do them with outer seams, that they are in any case not rubbed leg. It is not necessary overdo it with the decoration items. If you do decide to decorate it with ribbons or beads, fix them you need very high quality. Because, first of all, you must not forget, that the product is made, though for the very young, but still very curious toddler. To warm bootees better to take a yarn thicker, eg, baby wool or acrylic, and for summer shoes, respectively, fit more slim – cotton. 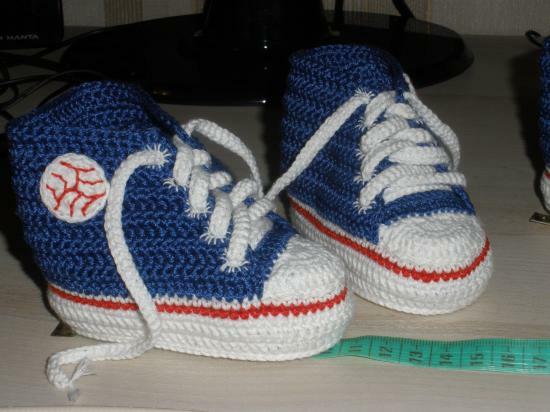 Before you begin, it is desirable to measure the size of baby's feet, and then according to him calculate the number of loops necessary to start knitting. Once selected yarn, you need to decide whether you want to tie booties knitting needles or crochet yet. Then selecting the desired tool can begin to create. Many needlewoman consider, that tie booties spoke much easier and faster, than hook, even for beginners, especially because it can be done in different ways: using the auxiliary or without spokes are only two, as well as due to the fact, that the required product is very small in size. 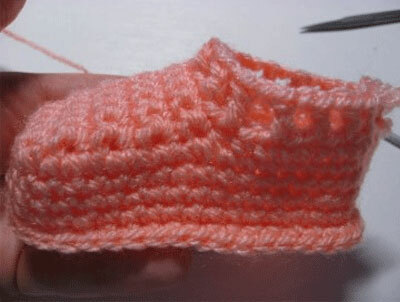 We offer you to get acquainted with a few instructions on knitting bootees via spokes. Pinetochki, associated with this manual are designed for year-old kid. For knitting, you will need 40-50 gram infant acrylic yarn and knitting needles of the third issue. Cuff. Knitting start with the upper part of the future booties, It called cuff. For this part of the very best choice is a simple knit gum 1 to 1, as it will allow the shoe to dress freely on foot and at the same time would be better to stay on it, but you can choose and handkerchief, which also holds good product shape. Gaining on spokes 39 loops, including two edge. In the event, if you choose the binding gum vyvyazyvayut must first face the noose in facial ranks, and then the wrong, and in rows as illustrated backstitches. Garter fit only facial loop. The number of rows is knitted depending on how high you want to see the future of the product. you need to knit for an average height of about 18-19 series. Eyelets. After vyvyazana necessary cuff height, you can start a number of which will make the holes for the future of lace or ribbons. This is done as follows:: in a number of personal provyazyvaetsya two loops along the front loop over the back wall, then snapped the thread on the second needle and is nakida, then so is knitted and the rest of the series. In the purl row, secure future eyelets, provyazyvaya his purl loops. 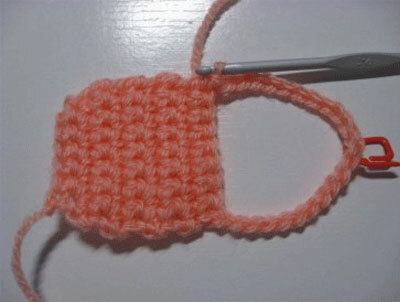 The next step is to divide all the loops into three equal parts, for knitting and peredochka bokovinok pinetochka. 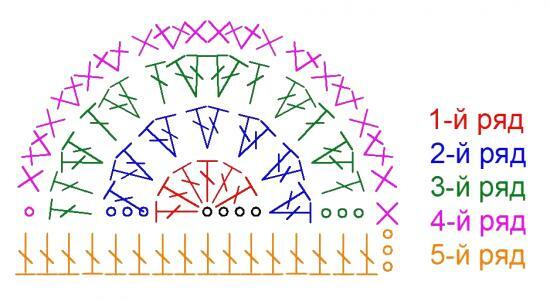 To do this, we take an additional third needle and toss it 13 petelek, the same number should be on the other two spokes. Then by using a fourth knitting needles proceed to the front of the shoe, from which will depend on the beauty products, namely on what pattern you choose for mating. 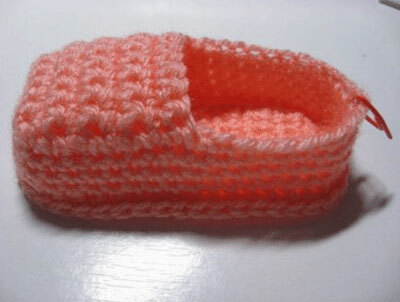 But since you have just started to learn tinkering booties, to start is better to choose something simpler. So, eg, you can try to make the ancestor viscous, with an unusual name "thread waste", which is fairly easy, and the finished product looks great. It is made by the following scheme: first row provyazyvaetsya as ordinary gum, through front and purl loops alternating sequence. On the second row under the seamy loop is knitted front, and at the front - Wrong, pattern is repeated until the end of the series. In this way, to raise mysochkah need to knit about 15 series. A compound of the side portions and mysochkah. The next step is to connect one of the side parts and mysochek. To do this, on the left side of the middle of the lifting pull eight new lifting loops(This is easiest to do with a hook, and then throw received loop back on needle) and then at the same average facial provyazyvaem needle loops located on the nearest side in the direction of knitting loops with deferred. Then knitting unfold, take a circular knitting needles, and they are all available at provyazyvaem spoke with mysochkah facial loop. Then joins a second sidewall with mysochkah. To do this again is knitted eight loops along the edge of the hoisting peredochka and provyazyvaem, left for another drum loops facial loops. Side part. WITH 1 by 6 number of sidewall knit on the front side, front loops on the wrong – wrong, 7 row – purl loops, 8 a number of facial, with 9 by 14 a number of knit as the first six rows. Sole. For the formation of the sole of all received loop again divided into three parts. On each side remains 21 loop, and on the middle spoke 13, as at the beginning knitting mysochkah. 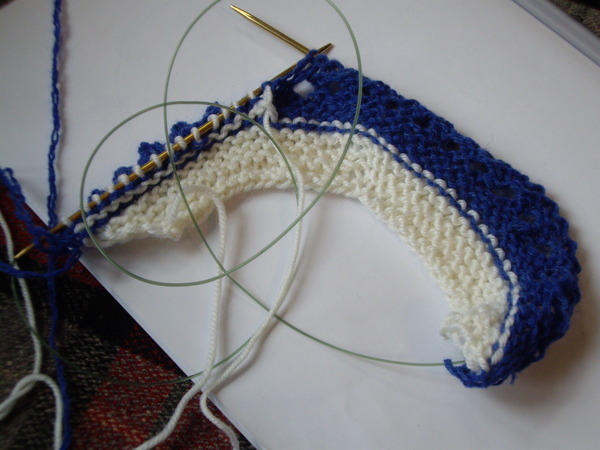 Then begin knitting in garter stitch with the middle of the loop. Provyazyvaem first row to 12 loop, and thirteenth provyazyvaem with the first loop of the sidewall, front loop, in that case, if the front side or the underside, on the reverse side. Then we turn around again and continue knitting his facial loops to the last number of loops, which also provyazyvaem together with the first loop of another barrel. Thus whilst knitting continues on the lateral spokes will not remain on 6 loops. Pyatochka. The remaining loops neatly secured by Gypsy needles or hooks. Assembling products. Sew a seam out booties. Then take a ribbon, ready shnurochek, either made independently of simple tabs chain, and vdevaem it into the holes designated for this. Origin ready bootees. The second slipper is knitted similarly. Assign booties on two spokes are also quite difficult not, and perhaps even better than, if you use a helper, since nothing will stop knitting. Therefore, you can experiment and try to make a colorful and never monotonous product. Knitting we need circular needles and children acrylic yarn white and blue, needle stitching, as well as the cardboard strip for the future of pompom. Once you cooked everything you need and you can start to work itself. Take the white yarn and type on circular needles 33 loop. Seventeenth – average mark eyelet and thread any other color, in order to avoid confusion and throughout the knitting was well visible middle leaf. 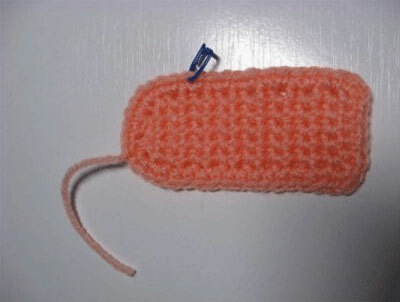 1-2 ranks is knitted loops of facial. 3 row – throws edge, then do one sc, provyazyvaem fifteen loops facial loops, then execute the knitting by the following scheme: nakid, front loop, nakid, 15 facial loops, nakid, bead. AT 4 row provyazyvaem all received facial loop. WITH 5 by 8 row repeat knitting with 1 by 4 ranks. As a result, we get the spoke 45 loops and finished sole. 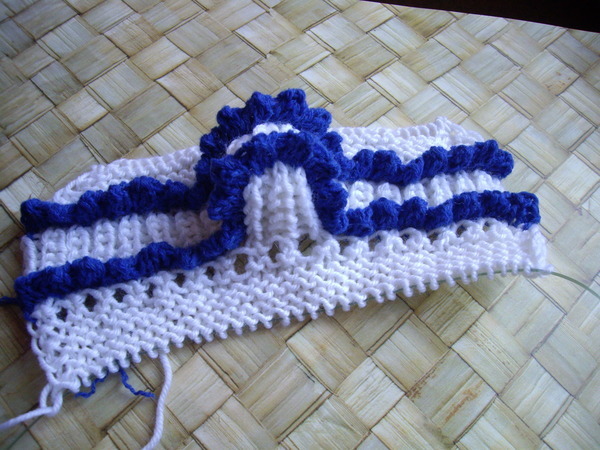 Change the white thread on blue and 9, 11 rows is knitted loops of facial, but 10, 12 - All Wrong. 13 row is knitted by the following scheme: two loops along the front vyvyazyvayut, and then make a sc, then knitting is repeated until the second spoke, including an edge there will be two singing, at this point again is nakida, then the penultimate loop is knitted face, and the last, as a bead at the end of a number of purl. 17 row It may seem quite complicated, but a little bit of patience and skill will help to overcome this stage and. For a number of knitting turn our product wrong side and then take the white thread. 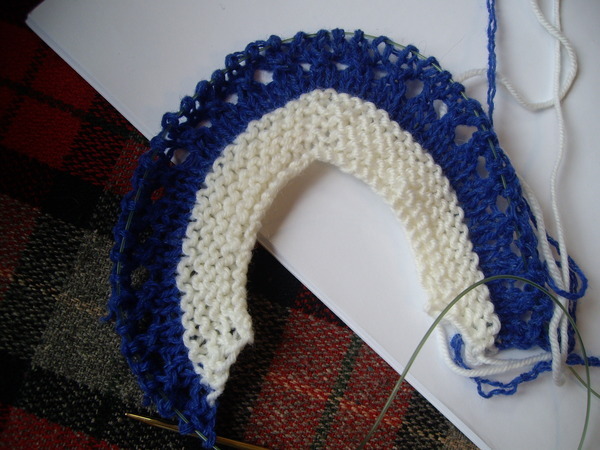 Then proceed as follows: do not remove edging and knit the first loop and knit on the same needle to hook one of the loops of varsoviensis on the left side of the white dotted line. After that, the first needle move elongated white loop and the first loop of knitting and provyazyvaem these two loops along the front. In this way, you must pick up and knit all the loops are white dotted line, trying to be careful not to miss a single, otherwise there is a risk to pull a knitted fabric. The result will be a number of complete pattern in the form of nice denticles. WITH 18 by 26 row on the front side of the knit pattern gum: Wrong, front, on the wrong side of the loop is knitted in pattern: under the front face, a wrong-purl. AT 27 row Master again cloves: To do this, change the white thread on blue and repeat knitting, from booties to knit by the scheme, described with 13 a number of 17 row. Remove an edge and 19 loops facial series provyazyvaem, then knit two purl(21 and 22 eyelets), two face(23- ), and the next loop(25, 26) you need to knit together the front. Then turn over knitting, and the following series mysochkah provyazyvaem scheme: 2 purl loop, 2 loops together, then again turn the canvas. Thus it is necessary to knit booties front until the middle loop was reduced to five, and the number of loops, left on the edges should remain unchanged, ie. by 15 petelek. Once the toe knit, dovyazyvaem 15 pristine side loops facial, knitting and unfold again provyazyvaem all facial hinge. As a result, the spoke should have 35 loops. One series provyazyvaem as follows: 2 loops along the front loop, 1 sc and so on until the end of the series. 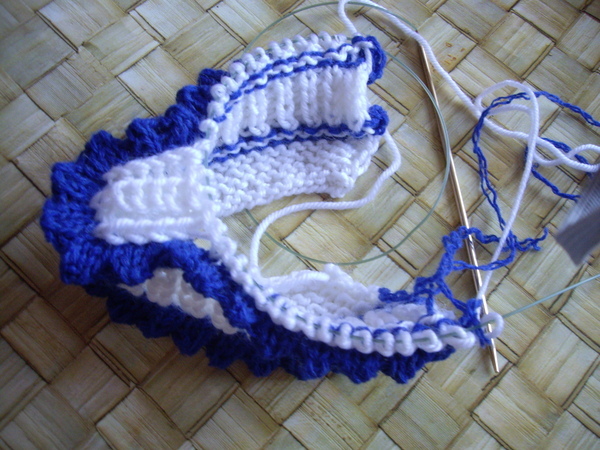 The following eight rows all loops knit facial. Then do another ryadochek cloves, with white thread on blue should not be changed at this time. In a series where we fix the kinks first distal edge not leave, and start throwing out provyazyvaniya and loops it to her, additional loops does not pull out the white dotted line, and out of the blue, located directly above it. Then pinetochek sew along the bottom and rear side, it's desirable, soft seam, or proceed to the outer and the second knitting booties. After both the shoe ready, making them two cords, in the form of braided pigtails, or a chain of air loops, and vdevaem them prepared for this hole. Take a thick piece of cardboard, but rather a cardboard box, eg, from cream or toothpaste. box size depends on how big is the future pompom. After that, the box is wound thread, and, The more you do that the coils, the fluffy will pompochik. In that case, If you want to see the bells on the laces, then you will need to take a needle and strong thread, color similar to bobble and attach it to one end of the lace. Then wound on the box thread very carefully removed, so as not to confuse, and draw them firmly in the middle of a thread attached to the cord a few times, then consolidate and tear thread. The next step is the cutting of the thread turns on the sides. Then straighten and form strings Pompon, making it fluffy and volume. Despite, that many believe, crochet booties that much harder and longer, Yet this view is controversial. 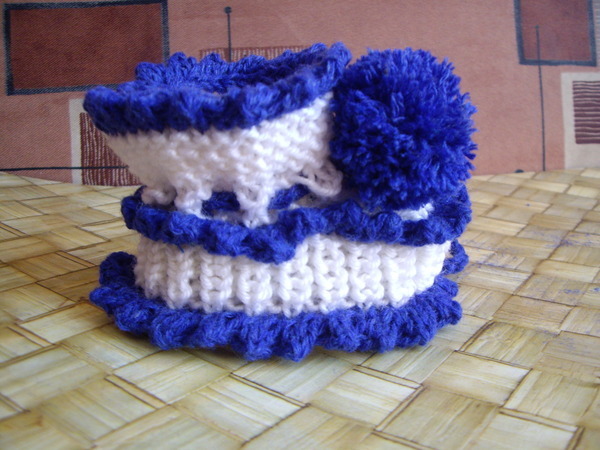 Since using the hook and thread can also create real masterpieces and spend it not much time, and knitting variants of this huge amount of products, it can be booties shoes, the shoe or even small sneakers. So do not immediately abandon the shoe to try to knit with a hook. 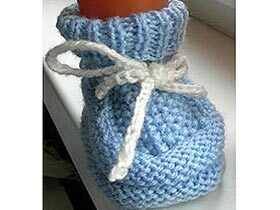 Consider a few not very complicated instructions how to tie a beautiful booties for babies and older. Take the hook C grade and a half, and children acrylic yarn of any desired color, in this example intended pinetochki girl, So I use pink thread. The first is knitted heel. For this is a chain of eight stitches, then in each loop chains, starting from the second, is one column with nakida. Then the work unfolds, is one air loop for lifting the row and in each loop of the previous column is knitted new columns with sc. In this way, provyazyvaetsya even two rows, and then make a row of columns without using the sc, and the thread is fixed and cut. The first row of seven columns with sc. The second row of air loop for lifting, two bars, without sc in the second loop, previous column knit with sc, 5 columns without sc in each next column and finally on the last loop once again made two columns, without sc. 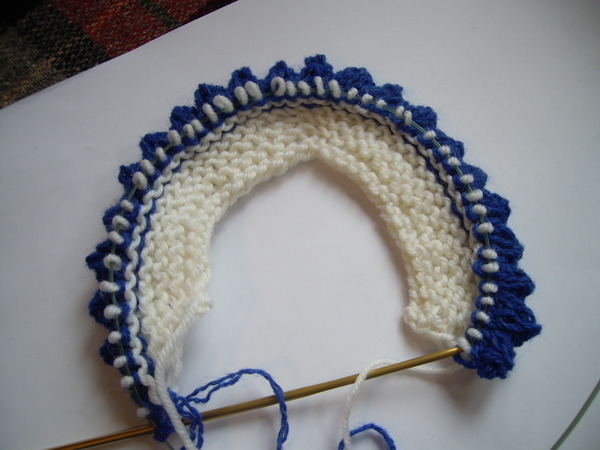 Beginning with the third series and finishing tenth, knitting proceeds as follows. At the beginning of each row do lifting loop, then provyazyvaem bars without sc in each sc around a number. Then do 23 air loop and mark the middle of a chain, namely the 12th loop of thread of a different color, for the convenience of the subsequent knitting. Then, attach the end of the chain to the opposite end of the series. 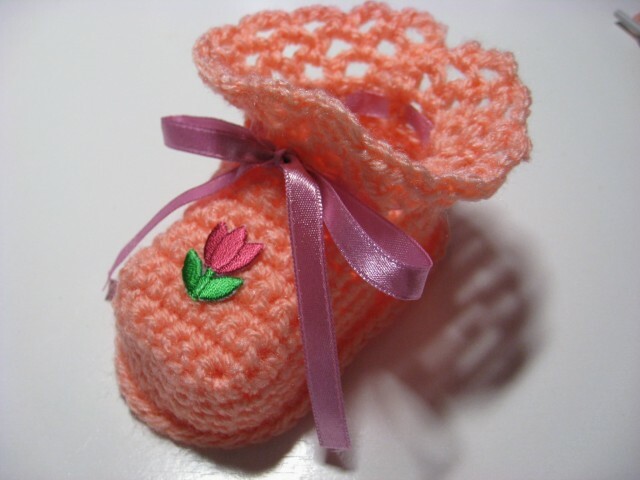 Then knit will be required for the full range of all booties , including chain loop. First row start on the front side. 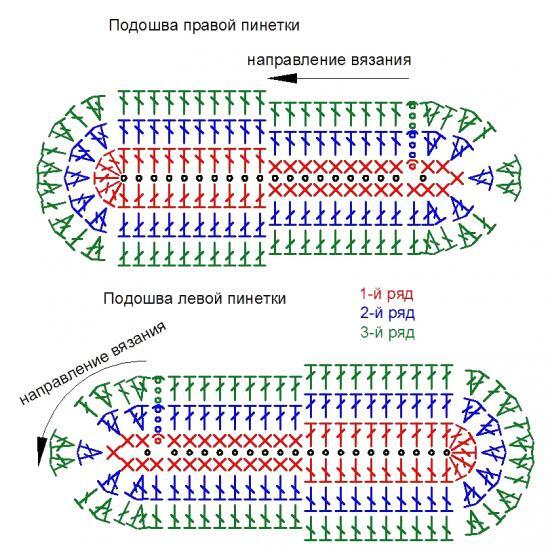 vyvyazyvayut 27 sc without columns in the front half of the shoe, wherein the side portion should turn on 10 columns, and on the front end – 7, then each loop is knitted air chain one without the pillar sc, all should get 23 column. After that, we fix a number of connecting polustolbikom. The following three rows provyazyvaem circular columns, without sc, since the loop in which provyazyvali polustolbik, and do not forget to do the connecting bars at the beginning and end of each of the new series. In the next step we take has knit sole and associate it with the upper part, also circular columns without sc. Having completed a number of connection, anchoring and terminated string. The final step is to knitting cuff, ie the uppermost part booties. Knitting to start with the loop, we noted a thread of another color. Attach the yarn is knitted in a circle and a number of columns, without sc, ending his connection polustolbikom, knit the first loop of the next row. The next row is knitted holes, targeting rope-laces. To do this, we collect 4 aerial loops, We get involved with their column sc in next loop through a series of, then again we do 1 air loop and a column and fasten it with a sc in the loop through one column, thus chain knitting to continue from 4 stitches, making the connection bar in its third loop. Third row cuff provyazyvaem to the end of the row under the scheme; three air loops, a connecting column without nakida in place of the previous series of compounds. The fourth and fifth rows of repeating pattern: 3 air loop and a column, without sc, provyazyvaetsya that the chain of the air loop of the previous row. is knitted lace, vdevaem it into the prepared holes and the first booties ready. Then booties second knit the same pattern. Ready booties you can decorate to your taste and imagination. For those, who wants to associate anything unusual, you can try to tie booties sneakers, which look very pretty and cute. These instructions are knitted booties for 3-6 month baby, but you can calculate the size of your baby's legs and increase or decrease the calculation loops. 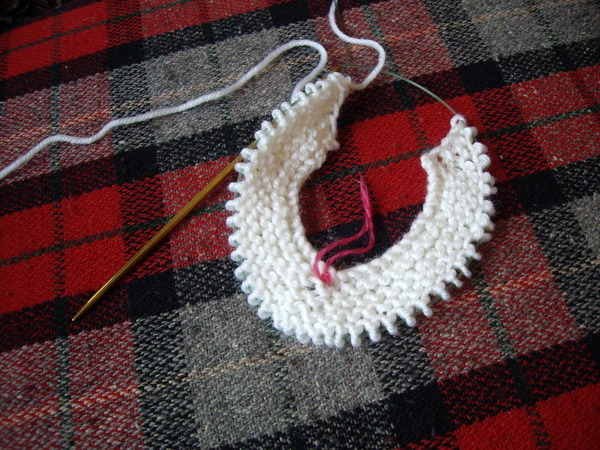 To start knitting recruit 20 basic stitches plus 1 loop for raising a number by a string of white. 1row. Since the second main air loop is knitted successively into each loop: 9 columns without sc(PTBs), 9 - columns with sc(CCH), 7 CTCH last loop series. We turn the canvas and continue knitting in a circle on the other hand typed pigtails, making series 9 PTBs, 9 CTCH, 6PTBs the final loop of a number of. At the end of each row do not forget to make a connection polustolbik. 2row. do 3 lifting loops, then provyazyvaem 19 CTCH, 5 just do an addition, provyazyvaya in each successive loop of 2 CTCH, then provyazyvaem 20 CTCH again 5 just make an addition to the end of the series - two CTCH in each of the five remaining stitches. 3row. Three lifting loop, 19 CTCH, 2 CTCH in one loop and 1stsn(repeat twice), 2 stsn one loop(repetition. twice ),1 CTCH, 2 CTCH(2 fold), 20 CTCH, 2 CTCH in one loop and 1 CTCH(repeat twice), 2 stsn one loop(was repeated twice), 1 CTCH and 2 stsn one loop(was repeated twice). 4-6 ranks. Three lifting loop, 72 CTCH the rear wall of the loop. At the end of the sixth series of the connecting thread polustolbik do red. 7 row. Gut-wrenching sole inside, straightening it and forming. After three lifting loops back all the loops of a number of thread is knitted red CTCH, connecting polustolbik again make white. 8 the last row soles and knit, as previous, but the white thread and since 1 lifting loop. Change the white thread on blue. We find the center in front of the sole and calculate the 7th loop on the one hand the center and mark it with a thread of another color, then on the other side does the same. 9row. Starting knitting starting from the upper part following upon the distinguished, that is, the eighth of the center loop. do 3 lifting loop, then provyazyvaem columns with sc in each loop to the mark. 10row. turn fabric, We do one loop lifting and provyazyvaem columns with sc to the first mark. 11row. Again turn booties, vyvyazyvayut 4 aerial loops and, starting with the 4th loop, We make columns with sc, leaving not knit 3 last eyelet. Then in the last loop of several provyazyvaem column with two sc. The resulting holes on the sides of Keda are designed for the future Lace. 12, 14,16, 18 ranks knit as the tenth, but 13,15,17,19 as the eleventh. 1row. In the first loop of the chain of air loops four, meddle 6 CTCH. 2row. 3 lifting loop, in the first loop to get involved 1 CTCH, and all subsequent to the end of a series of 2 CTCH. 3row. lifting loop, then the columns with sc to end of row-arc. 4row. lifting loop, 11 CTCH on a straight portion of the tongue, which is its top. White thread and cut the anchoring. 5 row. 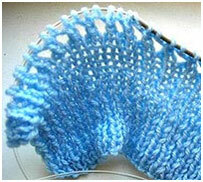 Take the blue thread, do 3 and lifting loop is knitted at the upper part of the tongue 11 CTCH. 6 row. Air loop, 11 PTBs. WITH 7 by 19 ranks all odd rows knit, the fifth, and even, the sixth. After that, all parts are connected, you need to sew from the wrong side of the tongue convex part to the front booties with white thread. Sole binds hook, and holes are sheathed by a needle and white thread. Lace is made of 190 stitches, in which provyazyvayutsya bars without sc, and then it is passed in the holes. Second-bootees kedik masters in the same way, as the first. Create small pinetochki for infants and for older kids not so difficult, you had to make sure, and the pleasure of the product, hand made and worn by a toddler, you get huge.